The luxury campsite at Rubicone is sure to impress with its private stretch of beach that fronts the warm waters of the Adriatic Sea. This natural haven has a lot to offer, including a range of 4-star facilities, a selection of dining options as well as several large swimming pools. 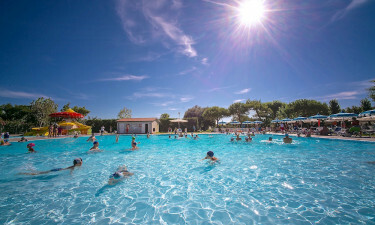 Book your stay with LUX-Camp and you could soon be soaking up the sun in the Rimini Riviera. Why should I camp at Rubicone? Camping Rubicone enjoys a magnificent location. Surrounded by lush vegetation and tropical flowers, this luxury camping site will wow nature-lovers. While there is plenty to keep you entertained within the 4-star holiday village, top attractions, shops, restaurants, boutiques, cafes and gift stores are all located within easy reach at the nearby old town. This incredible resort-style space has a whole host of facilities to ensure that you have a memorable stay. As well as the enormous pools, there is also a whirlpool bath and the option to hire your own private poolside cabana. Fitness fanatics can make use of the full-size tennis courts, fully stocked gym, and even enjoy free canoe lessons at the sailing school. There is never a dull moment when you book your stay at the Camping Rubicone resort, as entertainment options are varied and plentiful. A mini kids club offers fun games and activities to keep little ones of all ages occupied. When the sun sets, the main restaurant transforms into a fun and lively area. Talented singers, dancers and entertainers put on fabulous shows, while special events such as karaoke, dance lessons and movie nights are held throughout the summer months. There is also an evening discotheque that will be sure to get kids, teens and adults stomping their feet on a camping holiday.